Seeking a brighter future in megacity Manila, Oscar Ramirez and his family flee their impoverished life in the rice fields of the northern Philippines. But the sweltering capital's bustling intensity quickly overwhelms them, and they fall prey to the rampant manipulations of its hardened locals. Oscar Ramirez catches a lucky break when he's offered steady work for an armored truck company and gregarious senior officer Ong takes him under his wing. Soon, though, the reality of his work's mortality rate and the murky motives of his new partner force Oscar to confront the perils he faces in his new job and life. The movie portrays how far a man can go for his family. 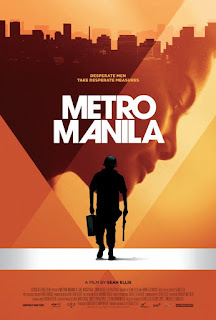 Metro Manila is 2013 British independently produced crime drama film directed by Sean Ellis, set in the Philippines and with dialogue mainly in Filipino. Ellis also co-produced and co-wrote the film. The film was selected as the British entry for the Best Foreign Language Film at the 86th Academy Awards, but it was not nominated.